IntelliJ IDEA is showing errors when I use Spring's @Autowired annotation in the class, but the class is functioning without any problem. Autowired members must be defined in the valid spring bean (@Component/@Service,etc.) less... (Ctrl+F1) Checks autowiring problems in a bean class. I had the same problem with IntelliJ IDEA 13.1.4 I solved it by removing the Spring facet (File->Project Structure) and leaving it to just show "Detection". Got the same error here! 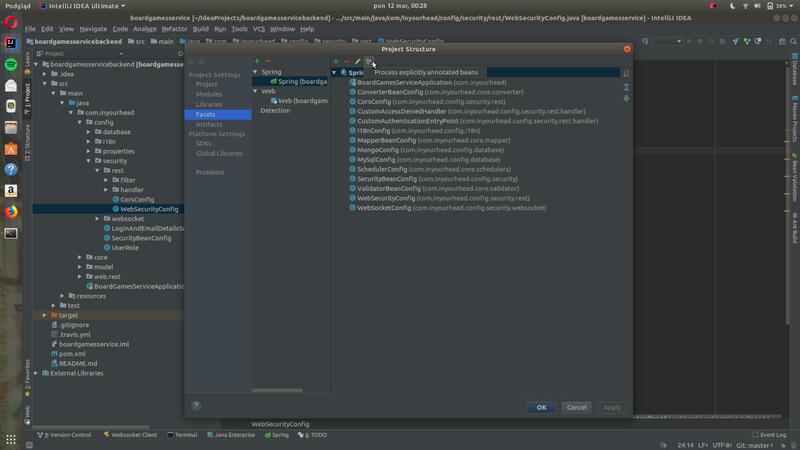 It seems the Intellij cannot verify if the class implementation is a @Service or @Component. Solve it just changing from Error to Warning(Pressing Alt + Enter). Sometimes IntelliJ cannot resolve if a bean has been declared, for example when the bean is included conditionally and the condition resolution happens at runtime. I had the same problem. I solved it by adding the Spring facet (File->Project Structure) for each relevant module, and then add the configuration files. For some projects (spring mvc), the config files where detected automatically. However, for a jar project, I had to add the configuration files manually. Make sure you have your Spring bean definitions correct. Sometimes, the application works fine, it just displays an error in the IDE, check your project ‘iml’ file if you have a Spring facet defined. Make sure that your IntelliJ Idea (IDE) is aware of all the necessary spring configurations that your module is being inspected against. Solved the issue by going to File >> Project Structure >> Facets and then adding all the configuration files to Spring Facet. After that it started detecting files in which the beans reside and was able to sort the issue. IntelliJ giving this check is quite valuable and IMHO shouldn't be disabled. I got the same problem. Mine was because the bean containing the autowired reference was not a Spring component (it was an EJB), but got a SpringBeanAutowiringInterceptor Interceptor allowing the use of autowiring. I think Intellij don't take this possibility in its Autowiring inspection. I had this problem too. Doing alt+enter and then asking to either re-run or disable Spring inspection on the effected line fixed it. This only seems to have become an issue after the 13.4 update. It seems like the visibility problem - the parent controller doesn't see the Component you are trying to wire. Mine is for not adding @Repository on my CrudRepository interface, the tutorial I was watching didn't add it on STS and it didn't complain. I solved that adding a Web facet. I've solved this problem this way. In IntelliJ all of your packages should be in a sub package which is the sub package of main/java. For example I've put all of my packages under src/main/java/com.misisol.watchStore/ and spring could find my beans then after. Inject Bean with @Qualifier solved the problem for me. a little late but i hope it helps to someone else. That's how i fixed the error. Not the answer you're looking for? Browse other questions tagged spring spring-mvc intellij-idea warnings intellij-inspections or ask your own question. How to annotate a custom Spring Boot custom repository? Autowiring two beans implementing same interface - how to set default bean to autowire?